When a successful, acclaimed playwright named Alceste announces himself disgusted with the tawdriness and hypocrisy of humanity, and disparages both the luminaries of the arts and their critics, it should be evident that he is setting himself up for a fall of gargantuan proportions. Is he a voice of reason, or is he a Fool? And where does his own jealous love for one star of the stage leave him? Molière, after two banned plays, tried to tone down his criticism of the haute-monde circling Louis XIV in his 'The Misanthrope', but even with padded gloves, his punches carry weight. In the English version of the play by Martin Crimp, first presented on stage thirteen years ago, Alceste's rage and jealousy are incendiary; at the Comedy Theatre's current production, the actor Damian Lewis's veins throb and pop on his face as he launches invective after invective not only on the shoddy mores of the political elite (skewering the New Tories, for example) but also against the arty-farty social butterflies that flock around his love, Jennifer, an American actress in London played with exquisite control by Keira Knightley in her first professional outing on stage. It's not just that Alceste resents the constant male entourage that gathers around Jennifer, and that he can't seem to get a moment alone with her. He considers her acceptance of their hypocrisies a major flaw in her character, something he can't reconcile with his own bleak view of humanity. He is as inflexible as he is despairing. But Jennifer can be equally scathing, and in one vicious set of comments, demolishes the character failings of some of her closest supporters - the theatre reviewer Covington, the feminist teacher and acting coach she was once closest to, and the elegant butterfly Julian whom she depends on for entree into the right circles in society. When her two-facedness is revealed to her victims, they are crushed and appalled. And yet, like puppies, they come back to her, tails wagging and bellies bared for a tickle, when she bats her eyelids at them. 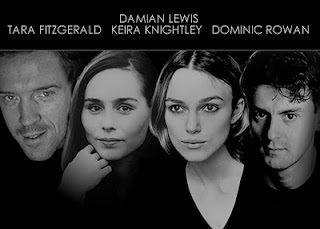 Knightley shines in her role both as a self-aware cynic, a loving beauty, and a shameless manipulator of her audience. If you can get tickets for this (so far) sold-out show, I would encourage you to do so. It's sparklingly witty, the verse is clever, the actors are beautiful and the venue is fine. An excellent way to spend an evening out of the dreary weather in London. I have modestly given myself the name of the greatest of the Eldar: Fëanor, the maker of the Silmarils and the creator of the Tengwar. He was a Master of many things. I am merely a Jack.